DORNIER will present its Composite Systems® business unit at the JEC World composite materials exhibition in Paris from March 6. – 8. 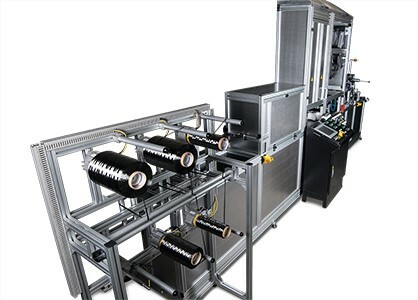 The machine builder continues to establish its reputation as a system partner for component, ber and polymer manufacturers for all matters relating to machinery and systems for manufacturing semi-finished textiles made from high-performance fibers. Handcrafted single-item production, small lots – these keywords still characterize the production of fiber-reinforced plastics (FRP) in all sectors which count on lightweight, ber-based structural applications, including aerospace, automobile construction, machinebuilding and even architecture. This is why textile research institutions and sector enterprises are pushing to develop reliable, economical processes for manufacturing FRP components on an industrial scale. Their efforts are concentrated on new developments and advancements of machinery used to make semi-finished goods from carbon, glass, aramide and basalt for composites. For more than 40 years, weaving machines by Lindauer DORNIER GmbH are the benchmark for processing high-performance fibers like carbon. But with the innovations of its Composite Systems® division the highly respected family business now also covers a large portion of the semi-finished goods production spectrum for FRP components as well. “At the JEC, we are going to demonstrate that the expertise we have acquired over decades in building machinery for producing semi-finished goods has also been applied to production equipment”, says Dr. Josef Klingele, Product Manager for DORNIER Composite Systems®. It is common knowledge in the industry that carbon fabrics for aircraft wings, car parts and medical technology all over the world are produced on DORNIER P1 roving weaving machines. But meanwhile the machine builder also serves the very vibrant tape market with its own production plant. The system is capable of producing dry and fully impregnated tapes in widths up to 600 mm and at speeds up to 30 m/min. Based on a special impregnation unit, the tapes now are impregnated with thermoplastic matrix material inline – previously this had to be done in a second step. The uniform and controlled alignment of the bers for the impregnation process is realized by a complex spreading mechanism, also developed by DORNIER. “We obtain very high spreading values”, adds Dr. Klingele. The finished tapes – this is where the system concept of Composite Systems® applies – then can be further processed on DORNIER’s tape weaving machine. This for example allows to produce woven organic sheets, more economically than before. The reason: fibers and plastic are readily combined in the tapes, they no longer have to be processed separately in an expensive step to make the organic sheets. The advantages for semi-finished goods and component manufacturers thus are shorter cycle times and lower production costs. 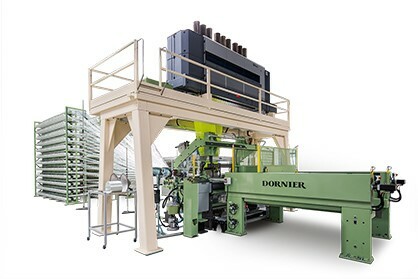 The experts at DORNIER can draw on decades of experience in developing customized systems when building machinery for semi-finished goods. “Composite components are subject to enormous constraints; no two machines for manufacturing semi-finished goods are the same”, explains Klingele. Producers of components, fibers or polymers often rely on in-house developments and modified machines. But they usually don’t have the system building experience they need. In order to meet customers’ requirements as completely as possible, DORNIER has established a technology center where specific system concepts for manufacturing semi-finished goods are tested, and customer trials are conducted. 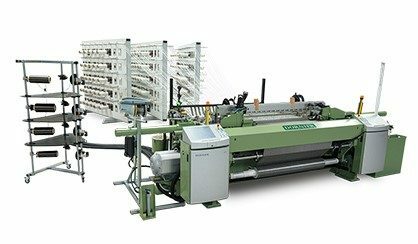 For example on 3D weaving machines, which weave in all three spatial directions. The machine builder from Lake Constance, which invests eight percent of its annual turnover in research and development, with these units offers its pioneering response to the trend towards lightweight textiles for mobility. “In the future, 3D fabrics will become indispensable elements in cars and aircraft”, of that, Klingele has no doubt.